Millions of jobs are likely to be displaced by automation but we have less to fear from robots than some might think, a report from the World Economic Forum has suggested. The Swiss think tank predicts that robots will displace 75 million jobs globally by 2022 but create 133 million new ones - a "net positive". It said advances in computing would free up workers for new tasks. But others have warned there is no guarantee lost jobs will be replaced. 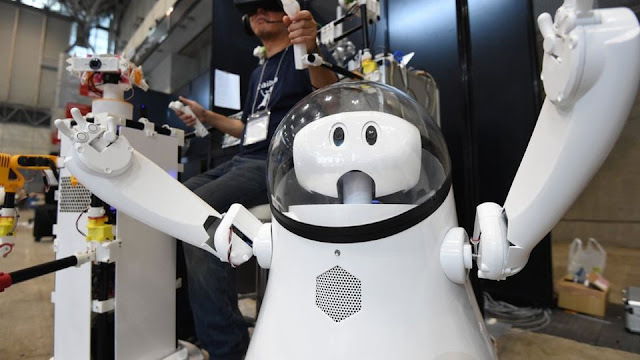 The WEF, which runs the famous Davos networking event, said that robots and algorithms would "vastly improve" the productivity of existing jobs and lead to many new ones in the coming years. As a result we would see more data analysts, software developers and social media specialists, as well as job roles based on "distinctively human traits" such as customer service workers and teachers. However, the think tank said the gains would come amid "significant disruption" as some roles become "increasingly redundant". Amid this "significant shift" workers would need to be retrained to update their skills, it said. It also urged governments to prepare safety nets for workers whose jobs are lost. In August, Andy Haldane, the Bank of England's chief economist, warned robots could wipe out thousands of British jobs. "The scale of job loss [in the fourth industrial revolution] is likely to be at least as large as that of the first three industrial revolutions," he said. Mr Haldane said companies would have to expand in innovative ways to create new human jobs, but whether they will manage to is an "open question". Others are more sanguine. In July, PwC predicted artificial intelligence would create as many jobs in the UK as it would displace over the next 20 years. And in April, the OECD disagreed with an influential 2013 forecast by Oxford University that found about 47% of jobs in the US in 2010 and 35% in the UK were at "high risk" of being automated over the following 20 years. The OECD instead put the US figure at about 10% and the UK's at 12% - although it did suggest many more workers would see their tasks changing significantly. This post was originally published on BBC.